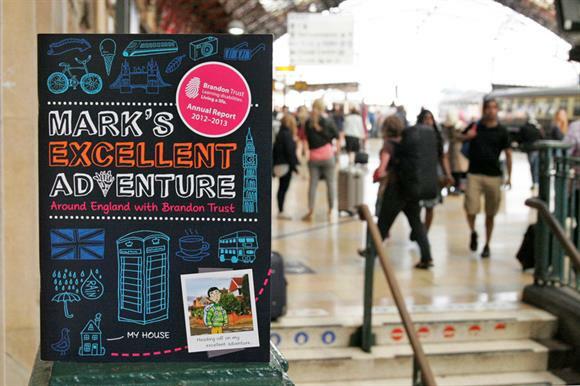 The learning disability charity the Brandon Trust wanted to ensure that its report was read from cover to cover, so it decided to create a fictional travel journal written by a person with a learning disability. Mark’s Excellent Adventure takes the form of a scrapbook, using photographs and objects such as bus tickets to showcase the work of the trust in different areas and illustrate the journey it has taken over the past year. A supporting film animates Mark’s journey across England, and includes in-depth interviews with other people with learning disabilities. The film is narrated by one of the trust’s beneficiaries. What did the report look like? Some elements were printed normally on the page, but others appeared to have been stuck in or put down on top of the report. A high-quality uncoated paper was used to represent a scrapbook, making the text and imagery look accessible. What feedback has the report received? More than 300 copies of the report were sent out, and it has been downloaded from the charity’s website more than 1,200 times. One reader said: "It feels like an unusual annual report and stands out from the others well." Reuben Turner, creative director of The Good Agency, says: "This was a genuinely different idea, relevant to the audience and executed with love and care."